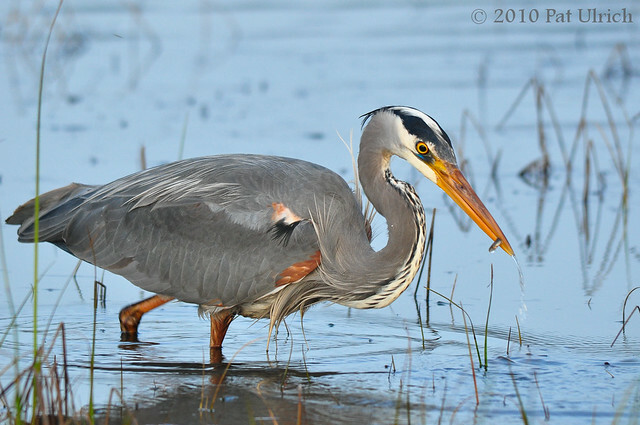 A few weeks ago I posted a few shots from the archives of a great blue heron at Rodeo Lagoon in the act of striking at prey below the water surface. However, I didn't include any shots of the bird with its prize. I've remarked before at how small the fish were that it was catching, and I stand by that with this picture as evidence. It seems like it would take a lot of these tiny fish to satiate a bird of this size. I've got to give it credit though, it was remarkably adept at catching such small prey. Thanks, Jarred. I totally agree -- I could watch these guys for as long as they'll let me (or in this case, until I ran out of sunlight). And no fill flash for this, it was taken right around sunset with the sun directly behind me and a fog bank that started just above the horizon.